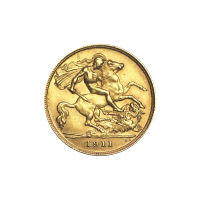 The British 1/2 Sovereign Gold coin was produced from 1911 to 1925. This coin was freely traded as a circulation coin while Britain was on the gold standard. 영국이 금본위제를 포기했을 때, 소버린 생산도 멈췄습니다. 뒷면은 말을 타고, 자신이 죽인 용을 발 아래에 둔 세인트 조지의 모습입니다. 이 같은 이미지는 거의 200년간 소버린에 사용되었습니다. Random Year 1/2 Sovereign Gold Coin The British 1/2 Sovereign Gold coin was produced from 1911 to 1925. This coin was freely traded as a circulation coin while Britain was on the gold standard. 영국이 금본위제를 포기했을 때, 소버린 생산도 멈췄습니다. The obverse features an effigy of King George V. 뒷면은 말을 타고, 자신이 죽인 용을 발 아래에 둔 세인트 조지의 모습입니다. 이 같은 이미지는 거의 200년간 소버린에 사용되었습니다. Dates on the coins we sell may vary from 1911 - 1925. This is actually a 1/2 sized Sovereign gold coin and as such the metal weight is 0.1286 Troy oz with an actual gold weight of 0.1177 Troy ounces. This is a pre-owned product, and as such the condition may vary.